Breakfast casseroles are one of my favorite things to make. My usual recipe is my Sausage and Egg Casserole . We have recently started having breakfast meetings at work and trade off on who brings breakfast each time. 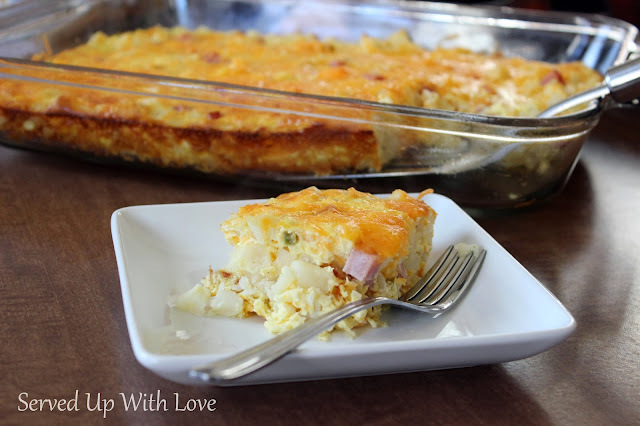 When it came time for me to bring a dish I didn't want to bring my usual casserole because that seemed to be a staple every time we had breakfast. I thought maybe it was time to do something a little different. Of course, I had to make sure it was edible. So I made 2, one for us to eat and one for work. This would even make a great dinner! Who doesn't love breakfast for dinner? Super easy to throw together and into the oven. Place the frozen O'Brien potatoes on the counter for about an hour to thaw or place in the fridge overnight. 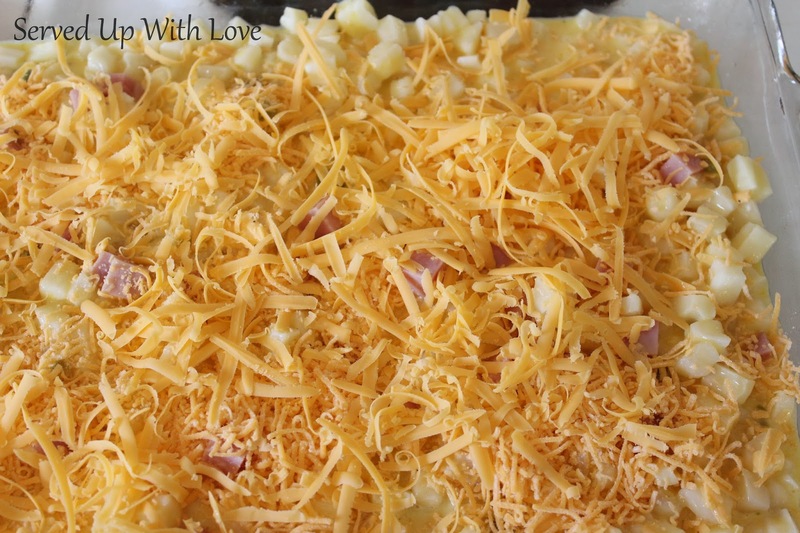 Place the potatoes in a bowl, add the cubed ham, and 1/2 of the cheese and eggs ( mix eggs in a separate bowl) and mix well. Spray a 9 x 13 casserole dish with cooking spray and pour in the mixture. Top with the rest of the cheese and bake at 350 degrees for about 40 minutes (ovens may vary) Check to make sure the eggs have set before removing from the oven. Can't find the Potatoes O'Brien-just add your own onions and peppers, half cup each. Saute in a pan until softened prior to adding to the mixture. Like more cheese! By all means add more or change up the kind of cheese. The possibilities are endless! Just curious..,what size bag of potatoes did you use? I just attempted this..it is in the oven now. But I now realize my bag of potatoes may be gigantic! Hello, I used just a regular size bag of hashbrown potatoes. I am not 100% sure of the size because I don't have a bag on hand to compare. I hope it turns out well for you.